There are instances in everyone’s life where making it in to work just isn’t possible. Whether it’s due to illness, family emergencies, or instances and events that just take higher priority, sometimes reporting for duty simply isn’t an option. 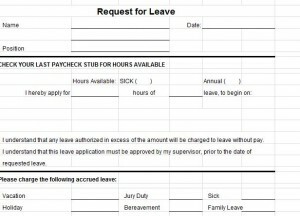 In these cases, a leave request form template can help ensure that the proper paperwork is filled out. This leave request form template can be downloaded instantly and is free. The leave request form template for is broken down into four different sections. The top of the form is reserved for basic information, such as your name or the name of the employee, the position you or the employee holds and the date the sheet is being filled out. The next section requires you or the employee to refer back to the last paycheck stub received. This will determine how many sick hours are available. Next, the person requesting the leave will mark how many hours they need off and when the period of off days will begin. By filling out this portion, the employee accepts that any leave authorized in excess of the amount will be charged to leave without pay. The employee also understands that the leave application must be approved by my supervisor, prior to the date of the requested leave. The employee will then sign the section after choosing the applicable option. The final section is for the supervisor to either denote whether the leave has been approved or denied. If request has been approved, simply mark the box next to “approved”. If the request has been denied, there is a space reserved for notes explaining why the request was not approved. The final step is for the supervisor to sign the document. This request for leave template is customizable, so you can add information based on your company’s policies or remove information if it is not applicable.